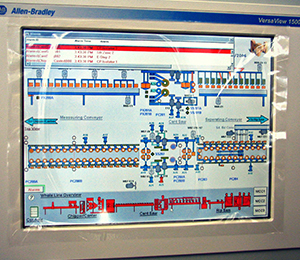 Many of MPM’s automation systems have an HMI / SCADA solution as part of the package. We have developed many different HMI solutions using a variety of different software systems. Our software experts bring years of experience to each project they undertake, and they are more than capable of programming a solution for your application. We also have experience providing fully customized Windows applications to interface with the user, and can develop a system this method if the interface is more complex than an off-the-shelf product is capable of. No plant operation can be easily monitored or controlled without visual communication from the process to the operator. MPM designs HMI screens to allow our customers the interaction necessary to control operations and receive information which may be vital to their decision making processes. Today, it’s not enough to buy just a database or just an HMI. You need all the pieces — visualization, optimization and control, plant floor data collection, and data storage and analysis – to make your plant truly productive. © 2013 MPM Engineering Ltd.